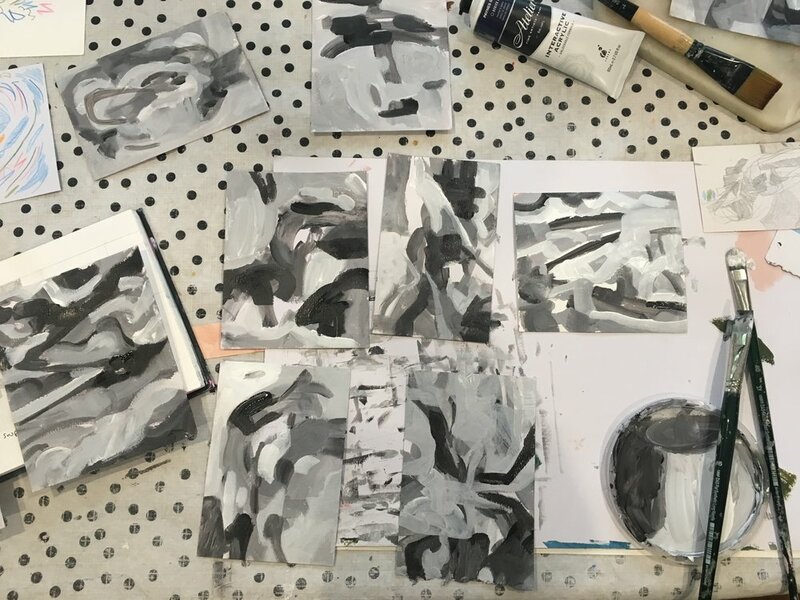 Those of you that know my story, will know that I went to Art college in the UK in the 90's but because of the self directed nature of the course, I've always felt that there were so many gaps in my knowledge about how to paint. So, over the last couple of months I’ve been delving into things that I usually just rely on instinct for. I've been reading about composition, about focal points and colour theory. I’ve also been looking at my favourite works of art and analysing why they work. I came across an article about how value - light and dark, can be as important as colour. I found this really interesting, so decided to do a number of monochrome studies by mixing only with black and white. I wondered if I could produce an interesting composition without colour. This was a good challenge for me as I am such a colour lover that I sometimes struggle for a long time, going round in circles to get the balance between light and dark right in a painting. After starting the year in this way I'm now dying to get on with making some big, colourful paintings and made a good start last weekend. I'll share these with you soon. Balancing life and creative time. If I could only get on top of things I’d be ok and have all this calm, peaceful time to create in. Last year wasn’t good, and I felt like I was failing in every area. I was behind with paperwork for my teaching, behind with laundry and housework, putting off a grocery shop and just topping up at the local , more expensive shop - every day and not being focussed on my daughter when we had time together. My lack of organisation meant that I’d be dashing out to buy bread in the morning, when i could have picked some up at the shop when I was there the night before. I wasted time on the wrong things and then rushed to do other things , doing them so them badly that I’d have to redo. I needed to streamline the everyday things and clear my mind so I have the time to be creative, without feeling guilty. So , in 2019 I’m trying a few new things. Here are some tools that I’ve discovered over the summer that look like they’ll help . I tend to write on little scraps of paper, sometimes enter events or things to do in the calendar on my phone, stick things on my fridge or the worst one, just trust that I’ll remember things. This means I always have this feeling that I might have missed something. I saw this video of a the bullet journal that pulls together all these things we need to remember and I felt like this was the solution for me. I’m doing a very simple version. I bought a basic A6 notebook and now, every morning I can sit with my morning coffee and in a couple of minutes can check what I need to do that day so that it clears my mind. There’s also future planning and random lists in there so no need for random bits of paper. To me the the TOMM method seems to be for people who just want to get it out of the way, without having to think about it. What I’ve taken from it is that I now set a timer and do as much cleaning in that time and then just stop. This idea suits me as I hate to think of my precious time being spent on cleaning. So far it’s helping because I’m more likely to start when I know it’s only for a fixed time. Using a timer with my housework made me realise I can do this for other tasks. Over the holidays my phone has started showing me my screen time hours - I was ashamed at how much time I spent on social media - 18 hours in the last 7 days ? I really need to get on top of this. I heard some advice on a podcast that said it’s good to set limits and before you go on Instagram you work out what you’re going on to do - eg to answer comments on your post and set a limit of 15 mins - Then get off your phone. It’s made me wonder how other I spend on other areas related to making and selling art and I want to know accurately how long I spend on actually creating, and how much on related admin like website updating, newsletter writing, packaging, researching exhibiting opportunities. Then I got recommended an app Toggl by another artist - and it’s just what I was looking for ! It’s the same as using my phone’s timer but I can click on a category like “ blog writing” . As I write now, the timer is running and I’ll know how much time a blog post might take next time so will be able to plan better. I’ve only been doing this for a week but I’m becoming more conscious of how I’m spending my time and am looking forward to seeing the results. Another thing I’m experimenting with is to block time for painting. If I know Tuesday evenings and Sunday mornings are my painting times then I won’t say yes to other tasks. I also won’t find myself thinking I wish I was painting when I’m doing something else bacause I’ll know I’ll be painting that evening, and I can enjoy the moment I’m in. So these are what I’m trying. I’m not going to beat myself up if I drop them all by March but it was definitely time for some kind of reset. Though I love to paint on canvas and paper equally, the artworks that I sell most are works on paper. They’re more affordable, easy to ship around the world and I think, it’s also easier to make the decision to buy work on paper. Photographs and art on paper are such a great way to start collecting art. I remember after years of slowly renovating of our first apartment we were finally at the stage of buying something to put on our walls. We chose three works on paper from a gallery near work. I remember that exciting, heart pumping feeling of buying original art, not a print, but something someone had created by hand. When we bought them the gallery offered to put us in touch with their framer and we were shocked at the time that the framing cost as much as the artwork. However, we decided to go through with it. When the framing came back we were really impressed. It was done so perfectly, it was so immaculate looking that it made the work look even better, more like an object that we’re going to hold on to long term. And here, seven years later, the art is in the same condition and I feel confident that it’ll stay that way hanging around our home in the years to come. Since then I’ve found out more about framing and so would like to share what I’ve learnt with you and what the options for framing work on paper are. I recently asked people on Instagram about framing and while most said that professional framing is the preferred choice , the cost sometimes means that we opt for an off the shelf frame. I recommend getting quotes from a couple of different framers if you haven’t used one before or are new to an area. I got quotes when I moved to West Auckland and they were wildly different. And I was surprised that it wasn’t the little framer down a side street that I expected to be the cheapest that was the most reasonably priced. Once you’re at the framers you need to make the decision about how you want your artwork framed . Here are some options. This is when the artwork appears to be floating between the glass and the backing. The art is attached to foam core and mounted on a white mat and spacers are used to separate it from the glass. I think this style of framing is suited for original art on paper. It looks professional and elegant and really draws attention to the art. It can be pricey but I think that it’s good to look at the long term view of it. You’re probably going to hold onto your artwork longer than you will most of your furniture, taking it with you as you move homes. Think of how many years of value it will give you in the future by making your home look and feel a certain way. I love how you can see the rough edge of the paper because of the way it’s been float mounted. Another option is matting, where a window for the art is cut in a matt board. I think this looks best with smaller paintings and drawings. I’ve put some of my smaller acrylics and watercolours in mats. It’s a good way to add space around a picture , especially if it’s near other artworks for example in a gallery wall. Some framers seem to offer a wide range of colours for matts. I prefer a plain off white. Here I used a mat in a readymade frame. This is when the image covers the whole of the area inside the frame. I think this is great for film posters, travel posters and art prints. If the art isn’t a regular size then professional framing could be needed for this too. Oh, another thing I should mention is glass. When you go and talk to a framer they will ask you about what kind of glass you want. This is the cheapest and offers basic protection from the environment and most of the time this might be fine. Think about where you want to hang your art. If it’s a very sunny bright room, you might find it disappointing if everytime you look at the art you bought , you see the reflection of yourself and your room. You might want to use non reflective glass. Museum glass or UV filtering glass. This glass claims to stop 99% of UV rays from damaging the artwork. This can be a good choice for watercolour as it can fade over time with exposure to sunlight and the colours become less vibrant . Acrylic can fade too, but at a much slower rate so unless it was in a really bright area I wouldn’t choose this option. One of my Mini paintings in a small frame with a mat. So far I’ve talked about professional framing but there are times when we just don’t have the budget but we can’t wait to get the art onto our walls. The best readymades I’ve found are the ones that framers make and sell off in a range of regular sizes. These are usually decent wood and the joints look well made. With the ready made frames I think they can look better with a matt. In Auckland I’ve picked up some good ones at the framers in Royal Oak shopping mall , at Homestead Picture framers and Factory Frames. Another option is to buy a frame and then get a matt with a custom window cut. Ask a framer to do this, you can even do this online. I know Factory frames offer this service in NZ. I think a small piece with a wide matt around it can look stunning. And you can always pick up a cheap frame at the big stores that sell homewares. If you’re buying an off the shelf frame, sometimes they have cardboard protection over the corners. I try to peek underneath or even pull them off until I find one where all the joints line up properly. I found some small frames at Kmart that were perfect for displaying my mini A5 paintings. At this size they do the job and work well with these little pieces. I think the problem with the cheaper frames is when you move up to larger sizes and they are less stable and I’ve had them come apart as I change artwork. 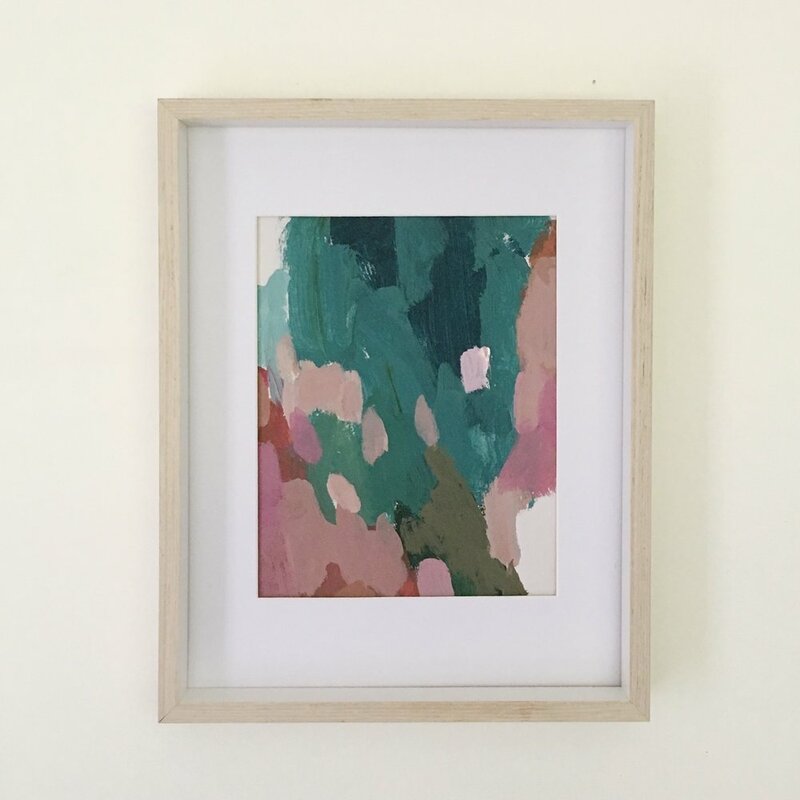 if you live in the US there’s an online Framer “ Framebridge” where you can send them your artwork, upload your measurements and they custom frame your art for the price of an off the shelf frame. We don’t have this in NZ so I haven’t used it but it seems to have good reviews and the frames look great. If you are buying direct from an artist it’s worth asking for a recommendation for a framer. It might even be worth asking the artist to arrange the framing as artists often get a discount for using the same framers regularly. I’m always happy to recommend, and l can also ask my artist contacts in other cities and countries for their inside knowledge. This is my first attempt at writing a blog post , so I’d love to hear from you on Instagram or email.